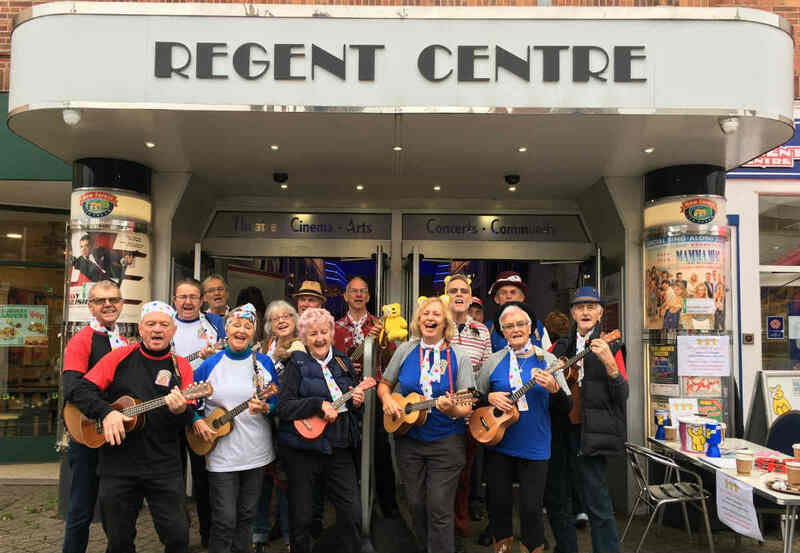 On Children in Need Day on Friday 16 November between 10am – 12pm, local ukulele band, Uke Box Glory, entertained the crowds in Christchurch High Street outside the Regent Centre. Regent Volunteers sold raffle tickets for a chance to win one of a number of special hampers that had been put together by donations from Regent staff, volunteers and some regular theatre and cinema goers at the Centre. These were all on display in the window of the Regent Information Centre and Box Office. Later that evening, Uke Box Glory were invited to appear on BBC TV South’s special Children in Need show which was broadcasted from King Edward’s School in Southampton. The organiser of the fund raising event was the Regent’s Information Centre and Box Office manager, Sara Stewart-Haddow, who has just announced that £1,562 has been raised for Children In Need.